The ability to perform many functions is becoming an important factor to consider when selecting systems in the construction industry. PerfectMembrane is a great example of a system that meets multiple needs. PerfectMembrane system is a highly effective overlay adhesion primer. It is used to bond decorative coatings to a wide variety of substrates including concrete, tile, and wood. It is compatible with a wide variety of decorative coatings and can be applied without the need for grinding the surface of the substrate. The membrane forms an effective waterproof barrier to protect the substrate below. 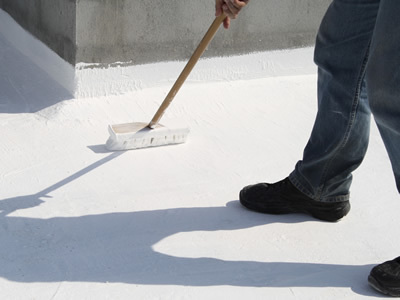 It is ideal for use on a wide variety of surfaces including decks, balconies, roofs, bathrooms and much more. It provides a long term solution for waterproofing. The membrane is effective at isolating cracks. The mesh fabric reduces the transfer of movement that causes cracking to top coatings. It therefore ensures that the coating will remain intact for longer. PerfectMembrane provides reinforcement for weak substrates. It is an effective system for strengthening substrates that are severely cracked. It can be installed on the existing coating system without the need for surface preparation. 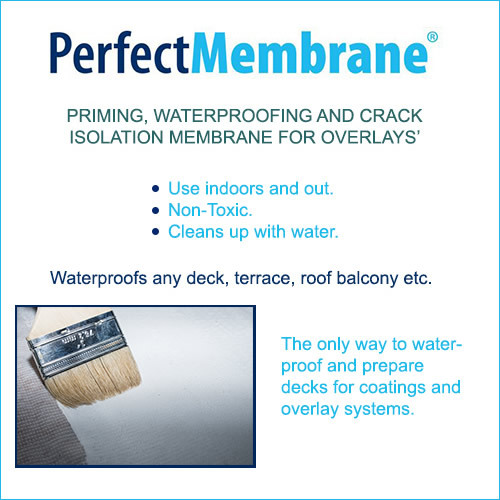 PerfectMembrane is a cost effective waterproofing system that performs multiple functions. The system never needs to be replaced, therefore, offering long term benefits at a fraction of the cost of alternative waterproofing options.